My oldest son, Matthew, at 3 ½ is prone to waking up too early. And when I say too early, I mean too early – anywhere from 5 – 6 AM is fair game in his book! Makes mornings a little rough, as my husband has to get ready for work and I have to get us all ready for the day while Matthew is at our feet. It makes for long days for all of us, with Matthew losing steam early in the day. School days are especially rough since there’s no real time for him to nap to try to catch up on his sleep. We’ve tried everything we can think of to try to get him to sleep longer, all with no luck. Thankfully, we know have a new weapon in our arsenal of breaking Matthew of this too-early habit from Zazoo Kids. 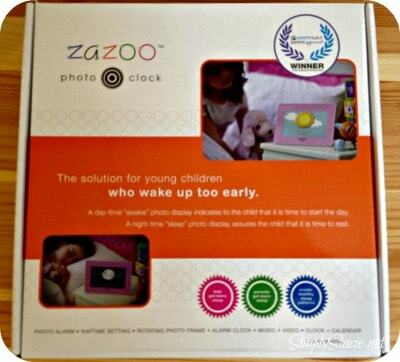 We received a Blue Peace Zazoo Photo Clock for review. The idea behind the clock is to help young children recognize the appropriate time to go to sleep and to wake up. It has pre-programmed images that can help young children recognize whether or not it’s time to get out of bed. We programmed a pretty day scene to appear on the clock at 7AM and a serene night scene to appear at Matthew’s usual bedtime of 7PM. We explained to him the differences in the photos and what each one meant. He’s excited to have the clock in his room and understands why it’s there. And while I was a bit skeptical, Matthew surprised us all by staying in his room until the clock changed to the morning scene, on the very first night it was in his room! He understands that being awake early is okay, but that he has to stay in his room and in bed until the image on the clock changes. I wish we had this clock a long time ago!! Another great feature of this clock is that you can personalize it with your own photos. It also has a convenient remote (which Matthew I’m sure will appreciate when he’s older). 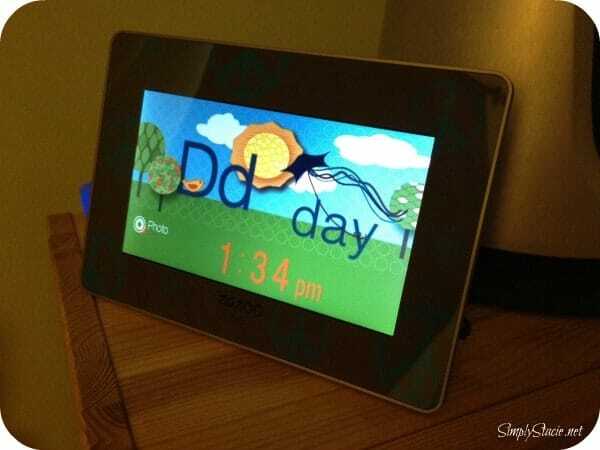 The clock is also designed to grow with your child – the alarm clock feature, rotating digital photo frame, music & audio book capabilities make this clock perfect for toddlers to teens. The Zazoo clock comes in a variety of colors and designs and sells for $89.99. You can learn more about the Zazoo clock on their website. You can also check them out on Facebook, Twitter, YouTube and their blog.